3 Days 2 Nights, under 100 € for 2. 20 years later, we are finally there … But not alone. Ushuaïa Nature was a french tv show about nature that started in the 90’s. That i never missed and Indre never watched. Being in Bali and collecting few info there and there. We decided to go to Kawah Ijen on our own. On the Island, they will offer you tour, going from 80 to 150 € / person (2M IDR). Not giving you a chance to follow your own rhythm, and it is just not our style. We would definitely do it that way, all over again. We packed light and jumped on the scooter, ready for adventure. 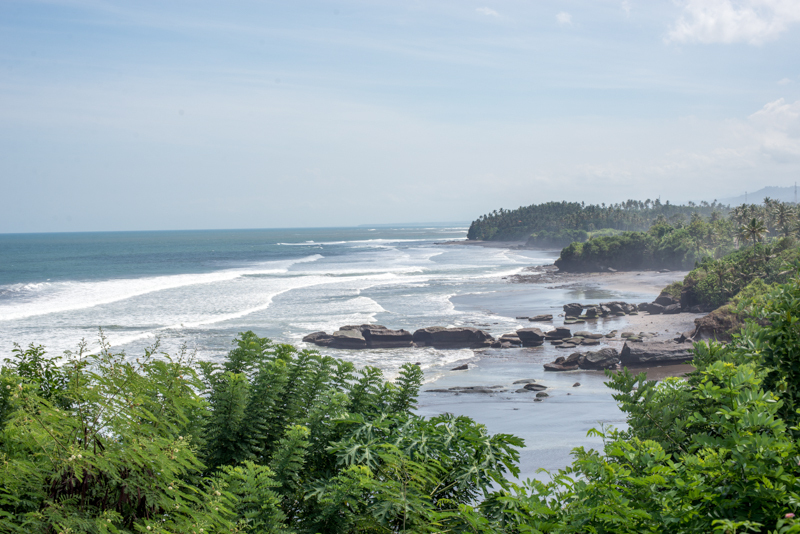 The drive was a regular Balinese one, slaloming and honking, until you finally leave the agglomeration, to follow a scenic road up the coast. Yeh Leh Beach was our first stop. A beef Bakso and a Mie Goreng did some good and i found a kite to play with. This particular beach Is made of thousands of boulders littering the shore. 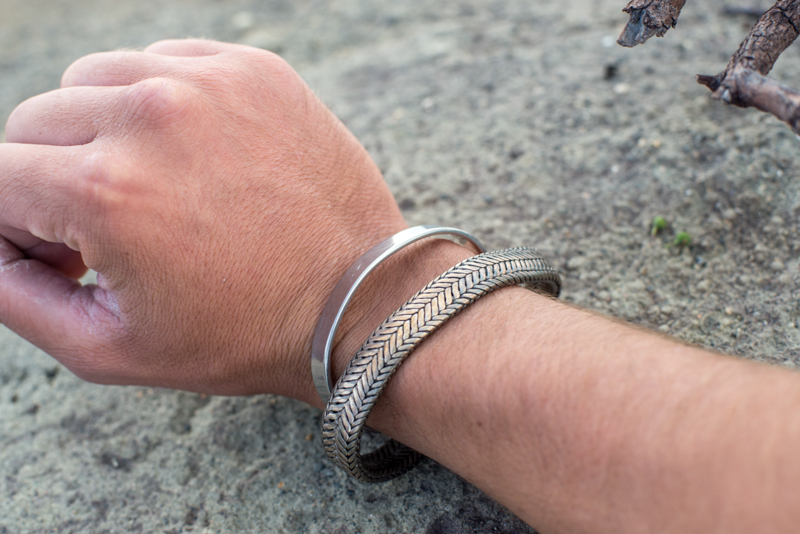 Great for sunset Photography at low tide. 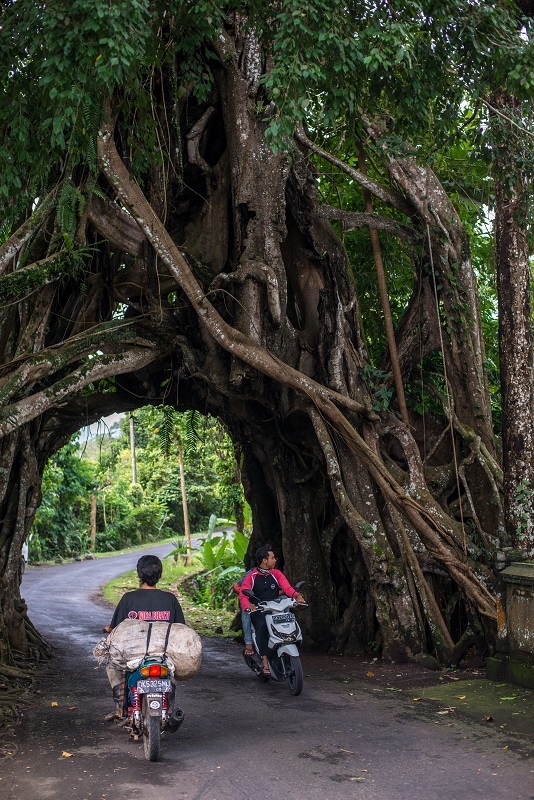 Just before arriving in Medewi, where we spend the night, we decide to reach Bunut Bolong Tree (“tree with a hole in it”). 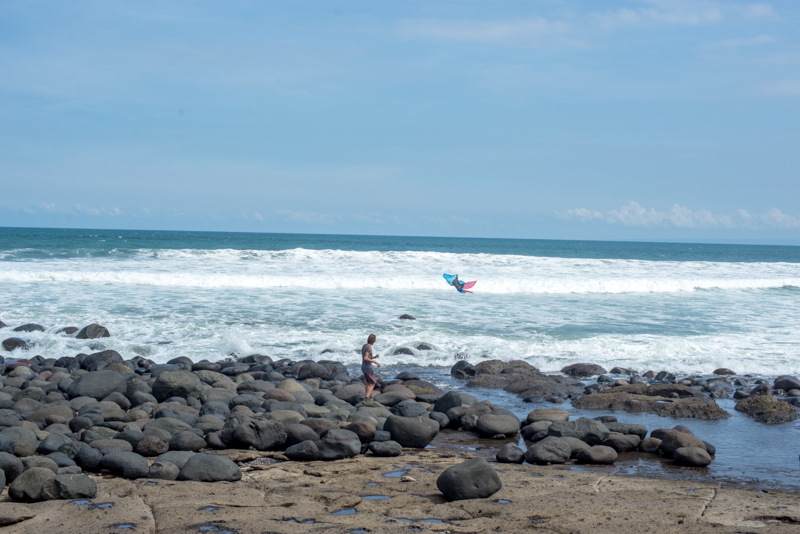 Located 10 km from the main road to Gilimanuk, it is located in Manggissari village. 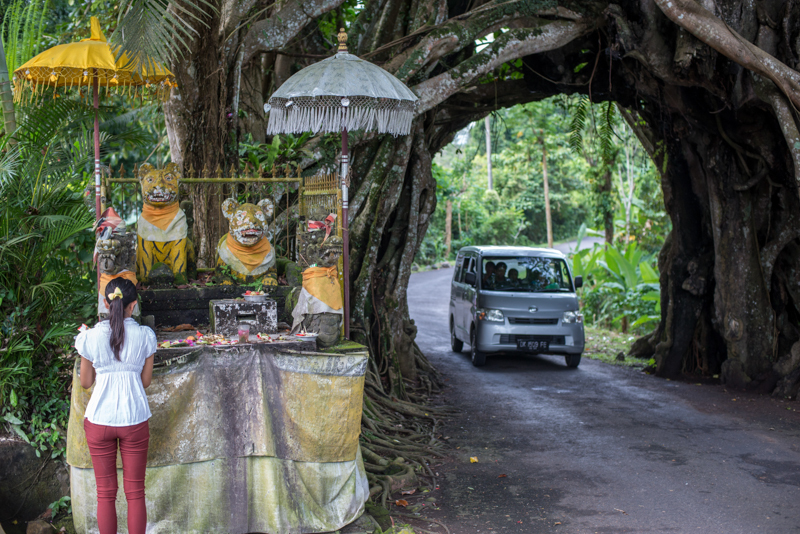 A massive Banyan tree, allowing a road to pass through the very centre of the tree with your vehicles. Brides and grooms are advised should not go through the tree, the legend says : “those who do will end up separated”. So, another road was built to pass around the tree. 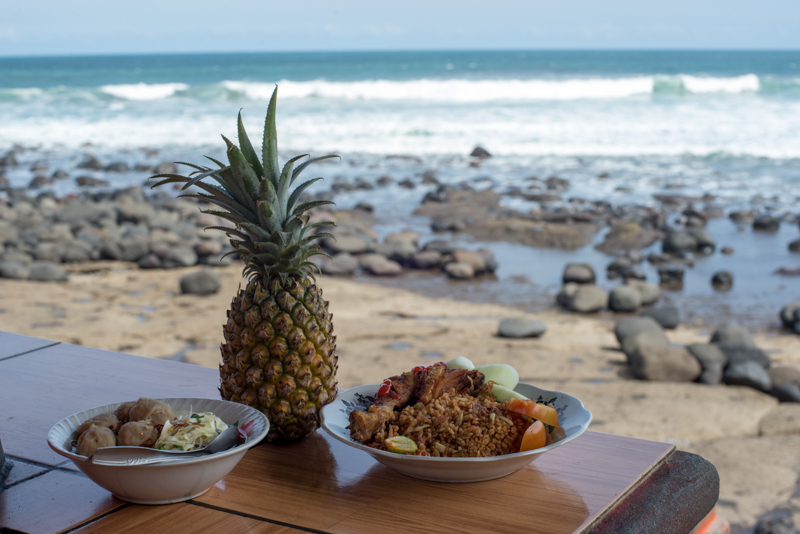 Medewi is a small town on the western side of Bali, best known for its surf spot, known well as the longest lefthander pointbreak in Bali. You better bring booties as it runs over big boulders. In a still authentic setting, very relaxing, far from the noisy atmosphere of the south. However, be careful if you rent boards, some scam have been reported. We stayed at Mai Malu for one night only. This second day will take us at the foot of the Kawah Ijen, in Banyuwangi, where we will spend the night before starting the ascent. 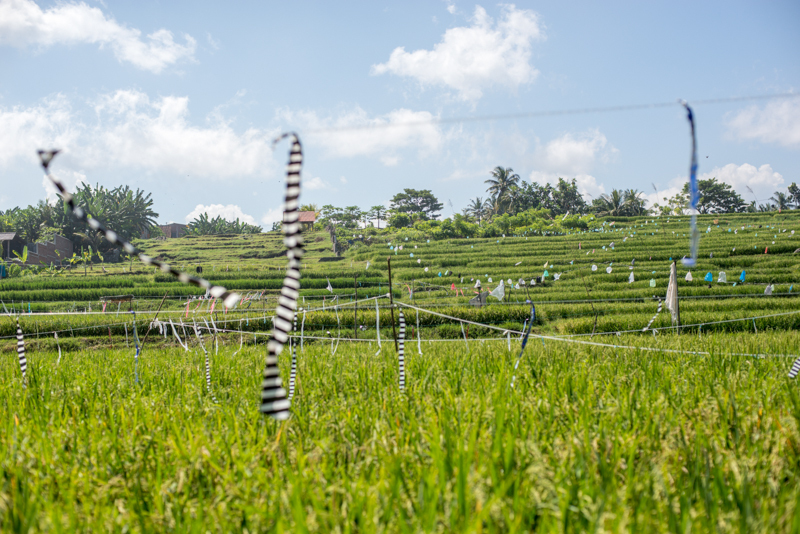 The first leg of the journey to Gilimanuk, is a succession of rice fields, small villages and plantation of palm trees. The many trucks carrying various goods from one island to another make driving a bit more sporty, as you need to anticipate early enough to overtake and sneak into traffic. Arriving at the port, we are far from the chaos imagined and written by other travelers. 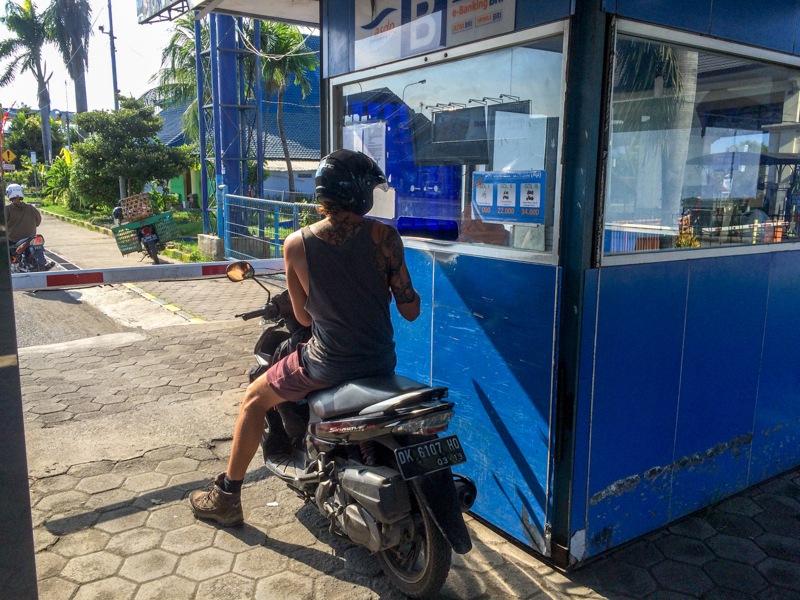 On either side of the ferry crossing you may find regular checkpoints of the Indonesian police, customs control will check any type of vehicle, in search of illegal transport of protected species, for example. As always, as a tourist, you are a manna of easy money, so think of always having the right documents on you. 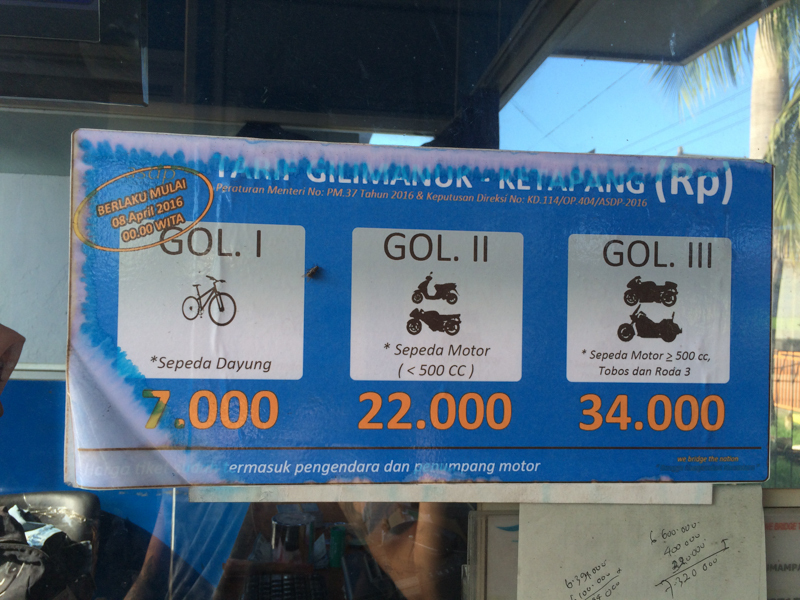 The ticket cost 22 000 IDR (1.63 $) for a scooter, you won’t have to pay for a person if you pay a motorcycle (2 people include). 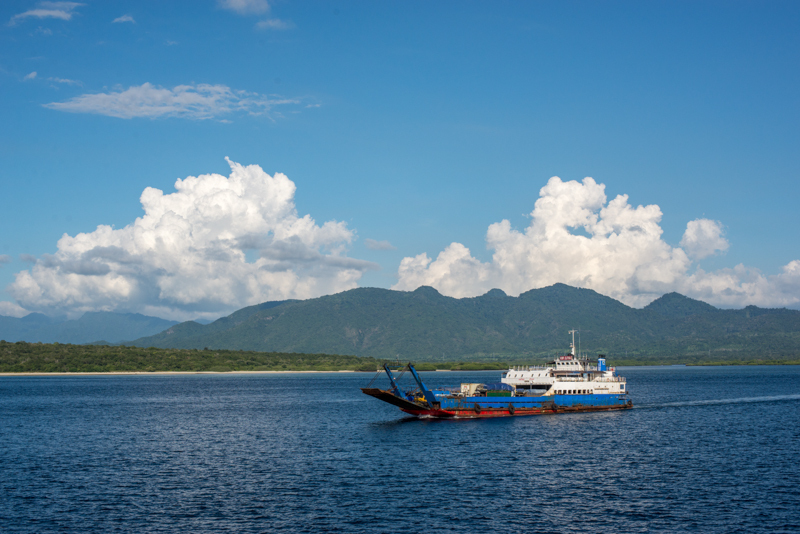 Ferries run every 20 minutes, 24 hours a day and take about half an hour to make the crossing, although loading and unloading can take much longer. 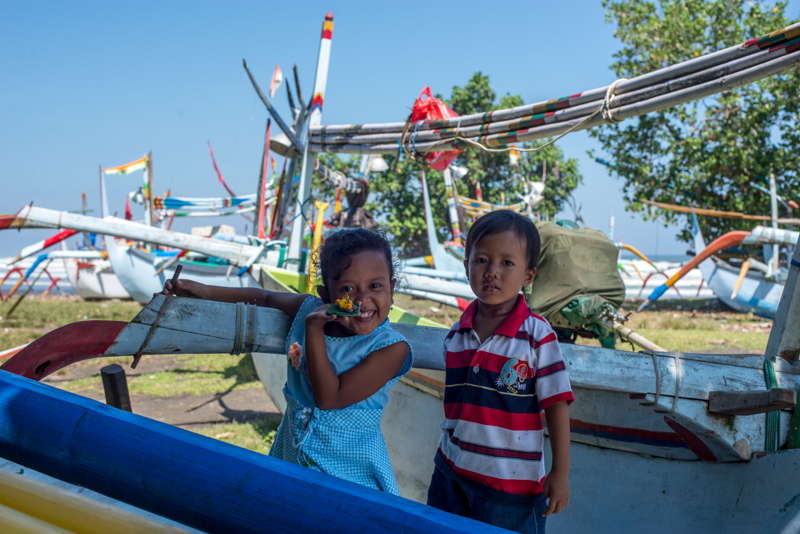 Freshly disembarked from the ferry, you will be, twenty kilometers from Banyuwangi. You will find on this straight line downtown several hotels of different categories, as well as a huge Hardys, the perfect option for your refueling before a trek in the days to come. Having not booked a hotel in advance, and planning to stay for only one night on this part of Java, we decided to choose the hotel as close as possible to our night departure point, to reach the Kawah Ijen. After 30 minutes of reviewing several guesthouses all feelling more stuffy and moist than the others, we set our sights on Kumala Hotel. We were able to negotiate the price, sleeping only four hours before getting up at midnight, the place was more than enough. The guys were nice and there were plenty of options for dinner. At midnight the alarm clock rang and we leave by scooter at the starting point of the Kawah ijen. As we had read before, the road actually on this side of the volcano was remade recently and there is no problem on this side. Miners leaving for work, frequently overtake us, they all have manual scooter and have no problem driving across steep slope. Only once we had to stop on the way up. 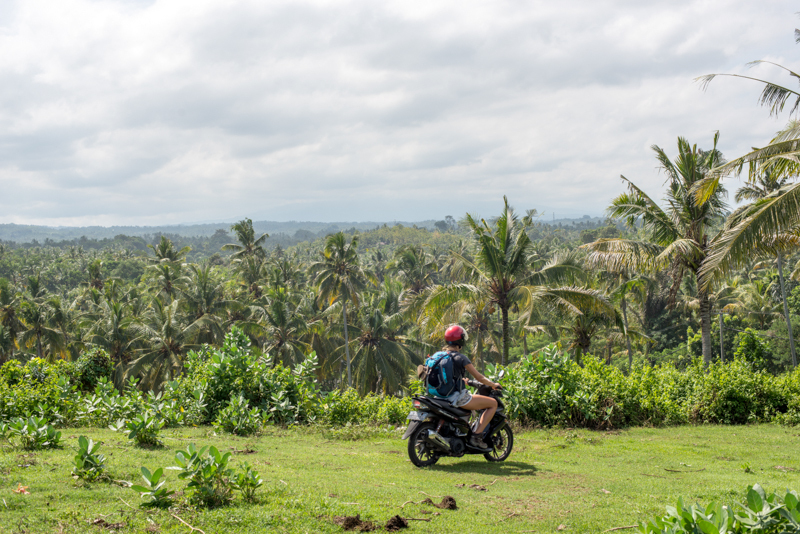 Our ride was quite new, a Honda 125 cc, and it shows his limit by carrying 2 person of our size on a steep hill. You do need to anticipate and break as little as possible to keep your speed. The cold being felt and the total darkness do not make anything easier. To sum up, bring some extra clothing if you plan on driving your scooter all the way up on your own, but don’t be scared to do so, it makes everything so much easier. You do know what to expect now. 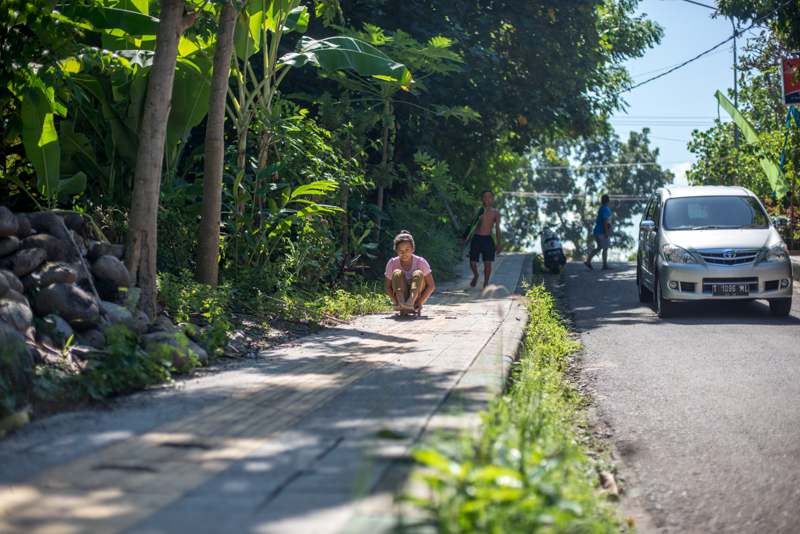 We didn’t tell you that: Halfway on the road connecting Banyuwangi to the starting point of the trek. If you are doing it on your own, we do not know about organized tours, it might not be a way to get extra money from everybody. Some locals will stop you on the road and ask you to pay 6K IDR per person. To subscribe at a “mandatory” body inssurance for this really dangerous trek. We just said that we had an extra inssurance with our bank, didnt need and drove away. Finally arrived in the “parking lot”, we started getting ready to not get colder than we already were. When a cloud of locals approaches us to offer us gloves, mask, flashlight … It seems like, western people coming on their own by scooter and well-equipped is not the norm yet. From what we had read while preparing the trek, we were expecting something more difficult. The path is clearly indicated and you can not take a wrong turn, as there is only one path. 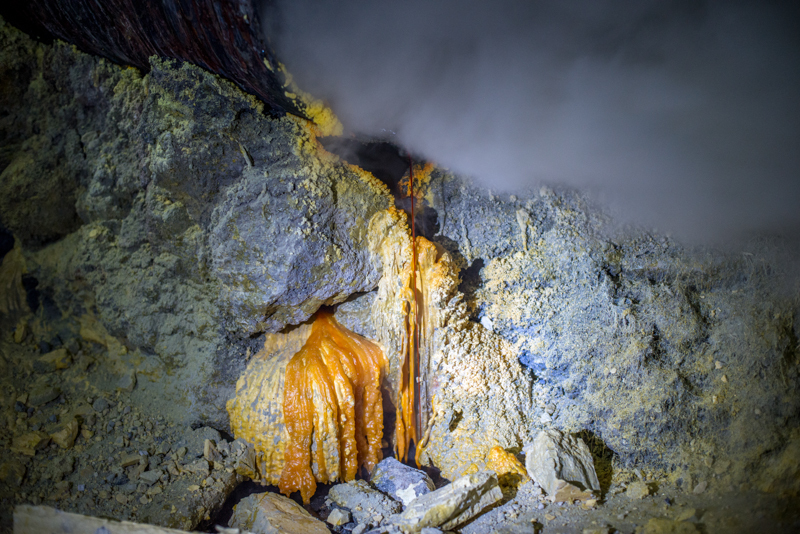 During an hour of climbing up to the rim of the crater, and according to the direction of the wind, smell of hydrogen sulphide (bad eggs) will become stronger and stronger. In case of inconvenience, a filter mask find in any pharmacy will suit. But it is only at the bottom of the crater that the gaseous emanations are too strong. In this case, it is recommended to have a 3M mask or a wet scarf in order to filter the particles. The masks leased by the Locals, are not of great use, their filters probably, little or never change. 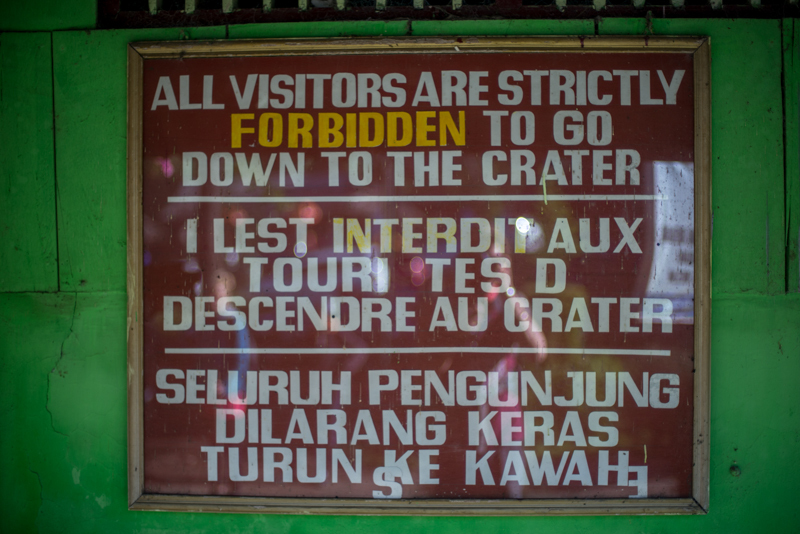 Once arrived at the top of the crater, the locals will indicate the very great dangerousness of the site, formally forbidding you to descend to the Blue Fire without a guide, even mentioning fatal accidents. So we started our descent towards the lake to approach the Blue Fire. As the previous section, there is only one way, while remaining cautious under bad weather conditions, there will be no possible problem. 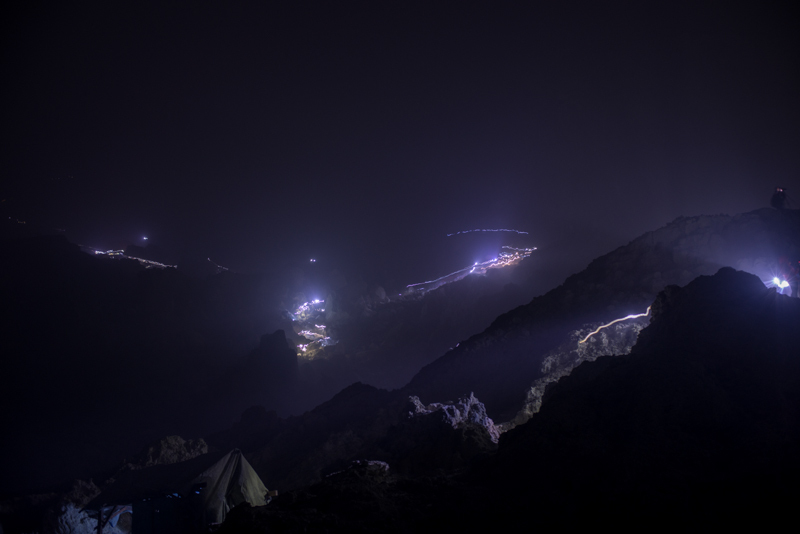 Everybody will obviously have to be a little cautious, do not go down with flip-flops as we did see, and be respectful of the rhythm of each, but do not take unnecessary risk, if you do not have proper lamps, or if the weather is not favorable. Simply follow the pieces of yellow sulfur on the ground and you will arrive safely down the path. As we tought to be running late at the parking lot, and the climb being easier than we had anticipated, we overtook many tourists, which did not seem to be in a hurry to get there. When we arrived downstairs, there were just two photographers on the right side trying to get the best picture as possible with their tripod. Groups of tourists with guide still not arrived. A small group of people, on the left, did approach the Blue Fire, trying also to get their new facebook profile picture. That morning, the cloud of sulfur was omnipresent. By going to the right, we tried to descend as far as possible to the lake, as we had been able to read previously on the Internet. It was impossible, after barely 20 meters, the wind shifted, casting upon us and all that surrounded us, a thick opaque cloud. In 5 seconds we lost all notion of space and our throat start burning. The main thing is not to panic … Go explain it to Indre … I had to catch her and pull her towards the direction that seemed right. It took 10 seconds to get out of the cloud but it seemed like an eternity. Long story short, be careful, work your free diving before coming there and pay attention to the path you are taking (just like Tom Thumb) in case of a problem. By the time we returned to the main spot of the Blue Flame, a tourist horde had arrived. One could see a bead of light emerging on the path that led to the top of the crater. 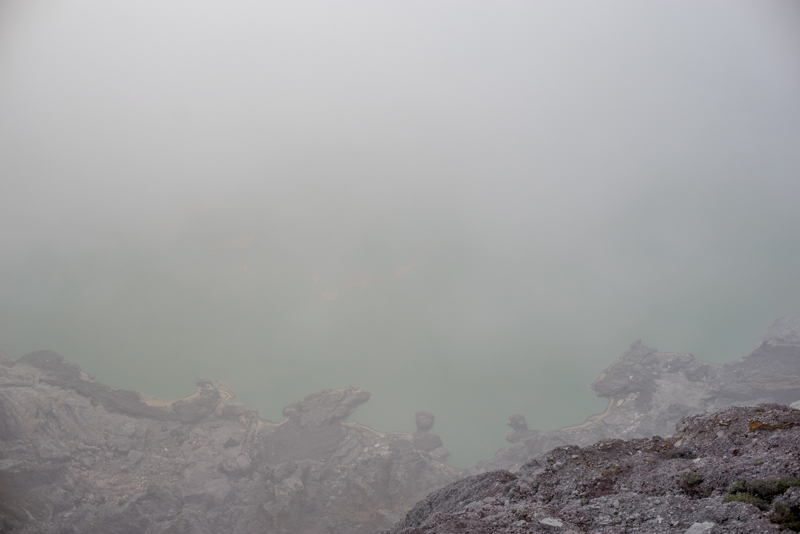 The pure sulfur vapors emanating from the turquoise lake – the most acid on the planet – are highly toxic. Neurological disorders, breathing difficulties, eye damage and burns reduce the life expectancy to 50 years. An open-pit sulfur mine, first exploited in 1911, during the Dutch colonial era. 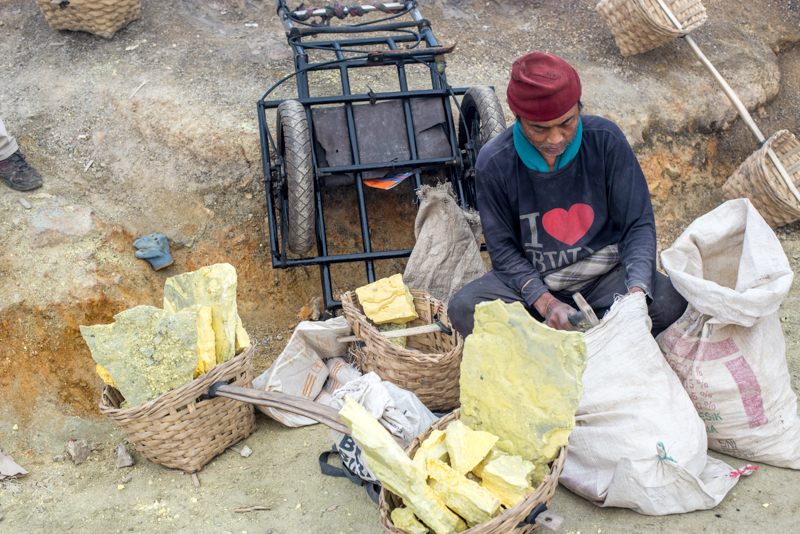 Since 1968, the company operating the site is base in Surabaya : between 200 and 300 are paid each day in proportion to the quantity of sulfur collected. The method of extracting the sulfur with picks has been the same for more than 100 years. 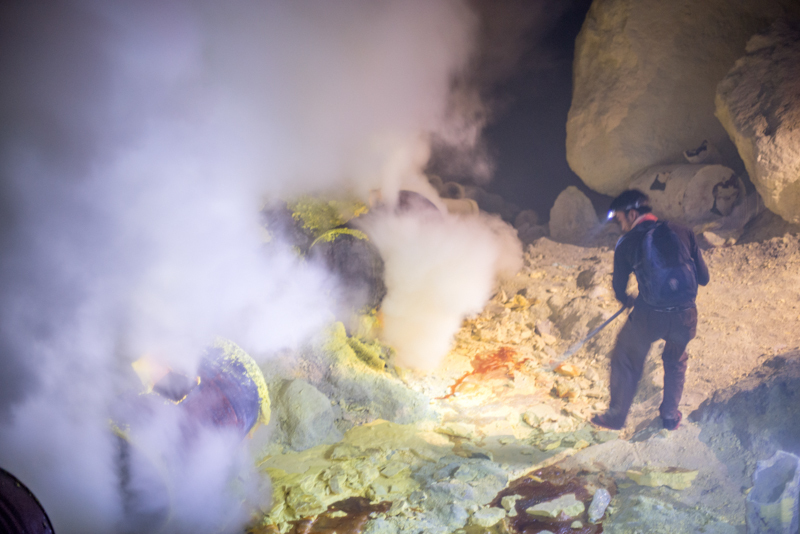 Fourteen tons of sulfur per day are extracted. After being treated in a plant in the valley, sulfur is then sold for the production of cosmetics, matches, fertilizers and insecticides or to bleach sugar. 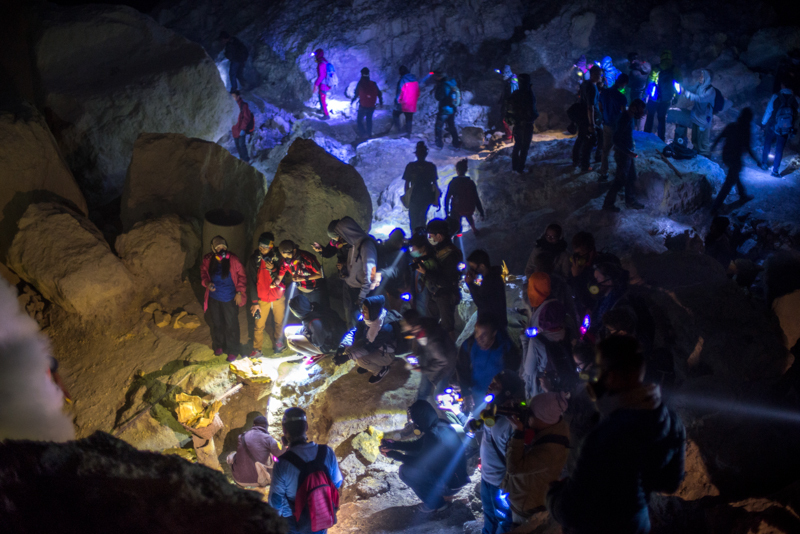 The site of Kawah Ijen volcano, now classified as a nature park, is managed by the regional government of Banyuwangi, perhaps, a new way of development is possible. A half-circle of stroller, around an extraction point, camera in hand, immortalized a scene of life, unimaginable elsewhere than in this volcano. 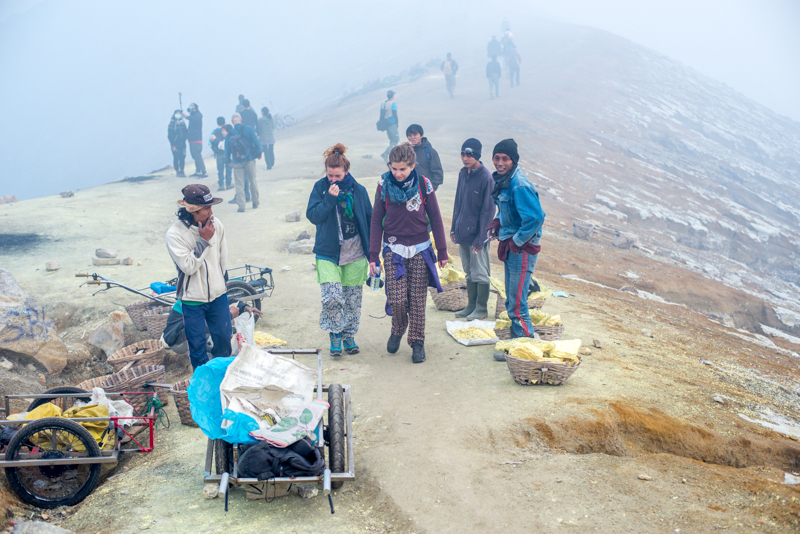 The Kawah Ijen attracts thousands of tourists each year. So much so, that the selfie has become ten times more profitable than the extraction of sulfur. On top of the barrels, the pipes leaks out. 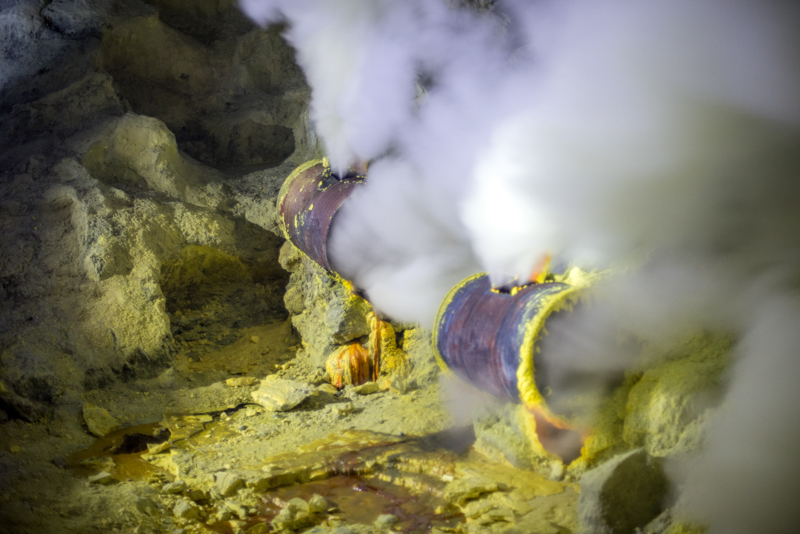 As soon as these gases leak out and touch the oxygen rich air, the gases erupt, shooting flames as high as 4 meters (sulfur melt at 115ºC only). From the moment the groups accompanied by guide arrive. 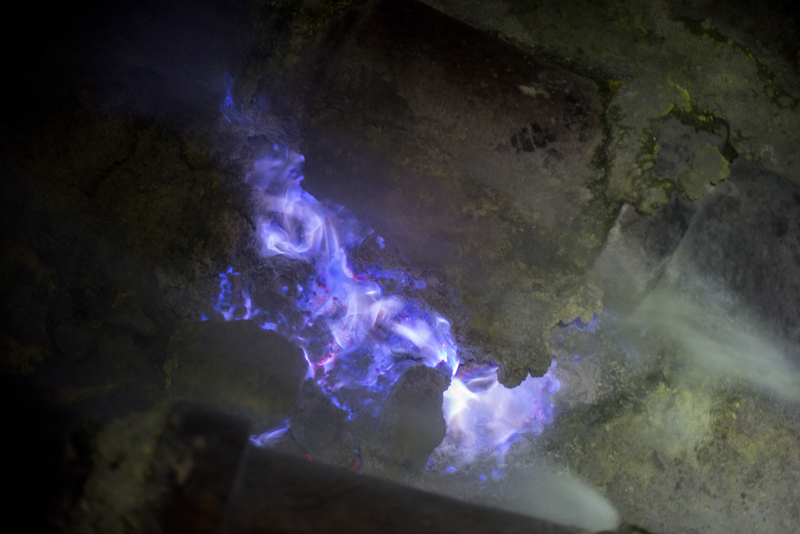 A whistle and shouts will be heard as soon as anyone climbs a little bit too close to the Blue Fire. This seems quite logical for security reasons. But the truth is very different. Only members of the groups with guide or anyone giving a tip can approach it. Happy to have arrived earlier and to have taken advantage of the quiet place, before the arrival of everyone. In contact with the sulphur, all your silver jewels will become black. It is therefore preferable to remove them before the trek. We did not think of it, but no worry. It is very easy to recover the original color, rubbing your jewelry with white toothpaste. The ascent is a little slower since the path is crowded. Everyone wants to be at the top for the sunrise. 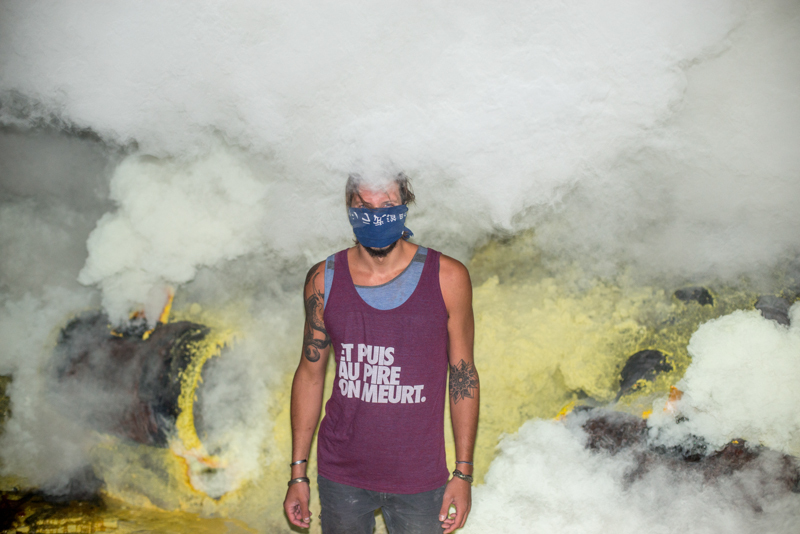 The sign “Prohibited to go down toxic gas” has a great success with the photos and we certainly did it too. Everyone sits on the side of the mountain, taking the time to digest what they have just experienced. Some leave happy to have witnessed a completely unique moment, out of time. After asking the locals in our “brilliant” Indonesian the best spot for sunrise. It depends on the weather, the wind, the clouds. We went to the end of the rim (to the left when you had just come up from the heart of the crater). 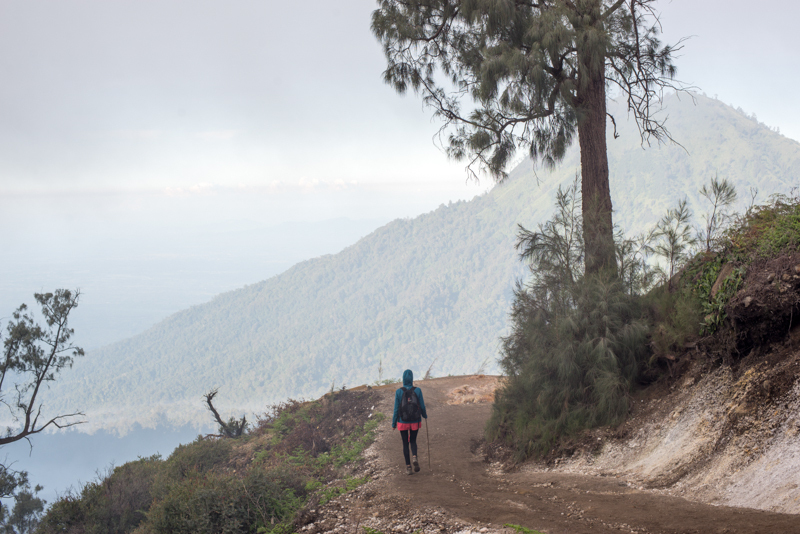 The sun rises on our back, illuminating a sea of clouds surrounding the Kawah Ijen. For a short space of time, we can make our shadows dance on the opposite side of the craters. The lake will remain discreet this time and we will finally see it through the thick cloud for only a few minutes. 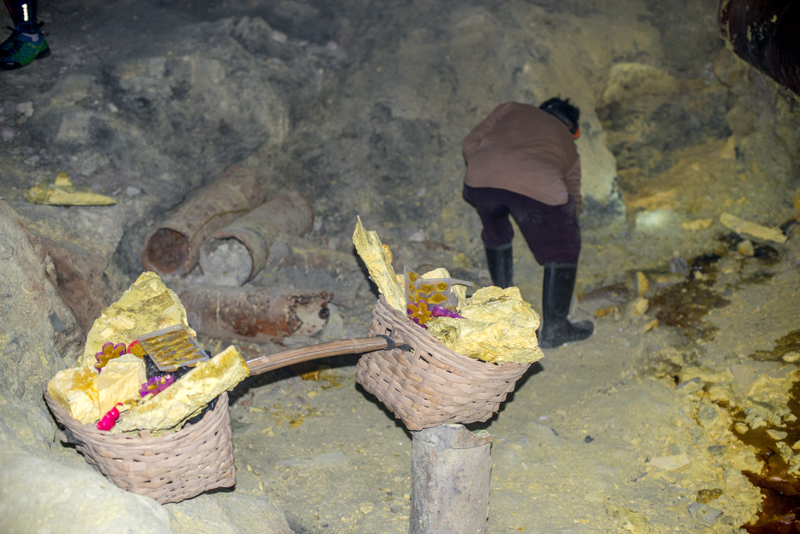 On the way back, the miners continue to descend the precious minerals, while others pose for photos, or sell, small sculptures and let the tourists try to carry their burdens. 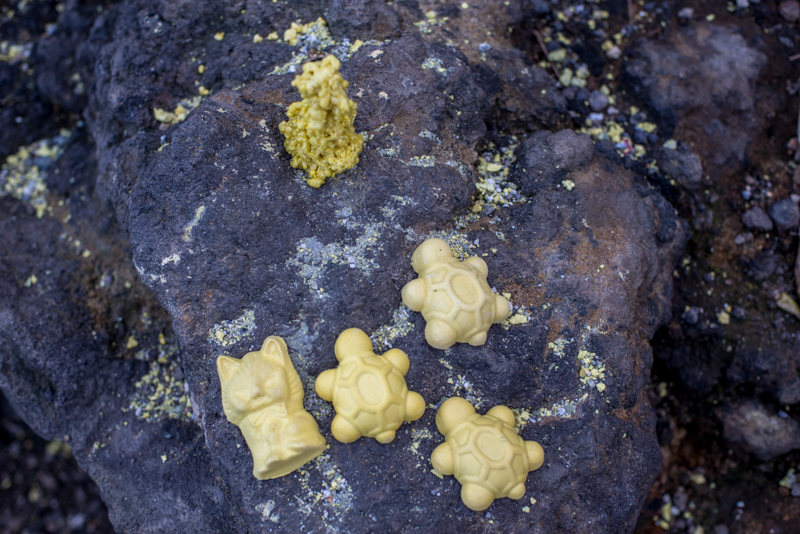 The arrival of tourists made it possible to diversify the income of the men working in the crater, they make small statues in the form of animals. The cake molds are filled with liquid sulfur,which, after cooling, hardens and takes the desired shape. Sold for almost nothing, at the time of their manufacture in the crater, at the top of it, or in the parking lot. 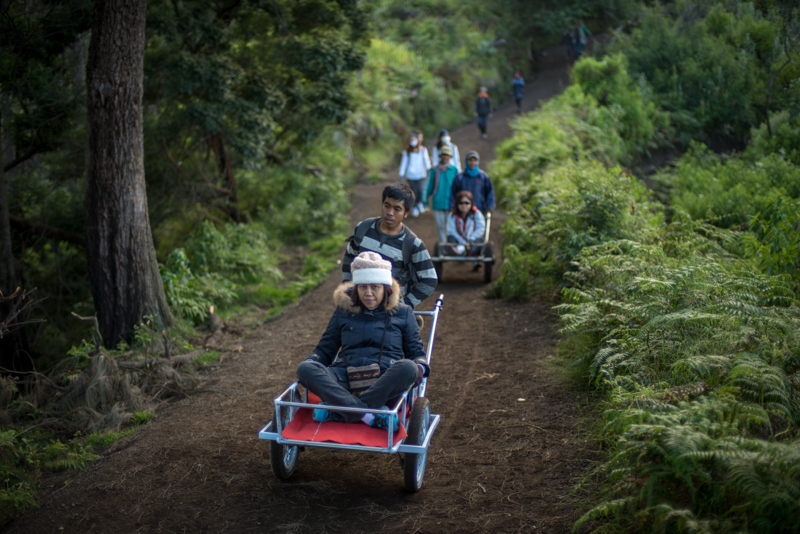 Other found another solution to improve their way of life, carrying exhausted walkers in wheelbarrows. We will make everyone laugh, once again, by leaving the car park with our little scooter in the cold, while everyone climbs in 4X4. From our knowledge, with the Danakil Depression, a low-lying plain in Ethiopia, this is the only place where you can see such a phenomenon. I cannot decide whether Ushuaia, or any other foreign television program that I do not know, has done more harm or not. Yes, there are hundreds of times more people than 20 years ago and you unfortunately get this “zoo feeling”. 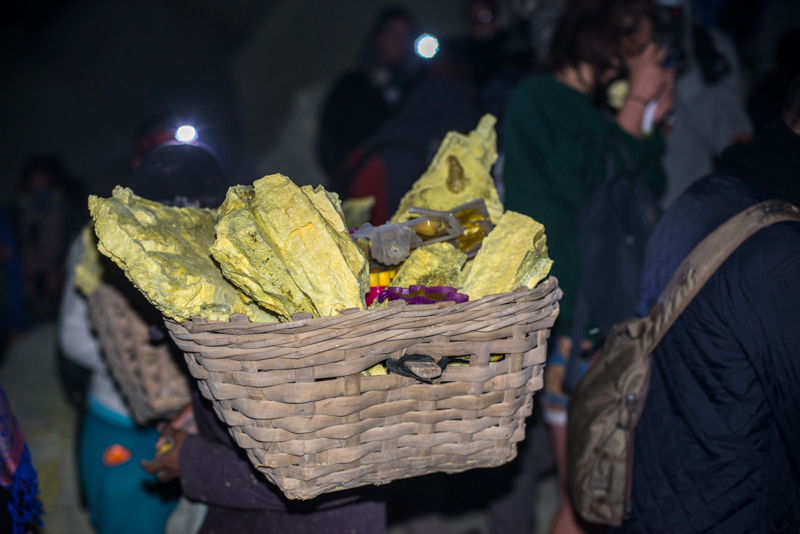 On the other hand “miners earn more money as a guide or even selling small sulfur sculpture. 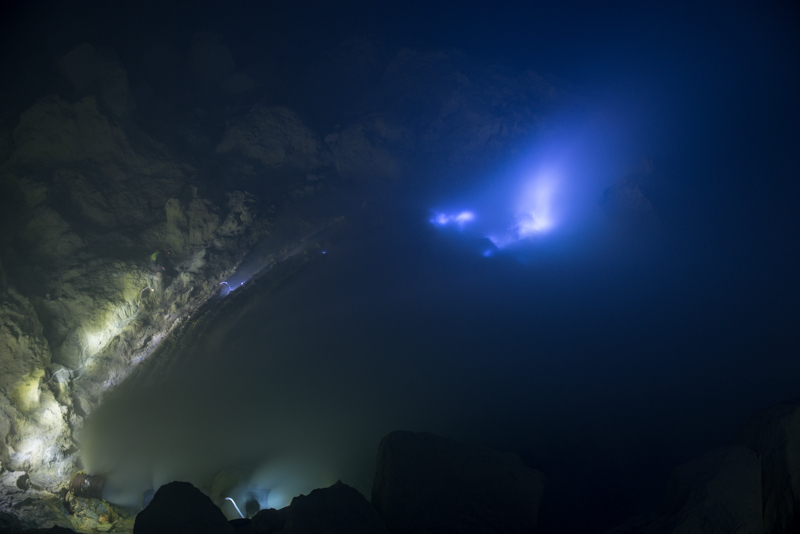 The place is definitely worth going to see the Blue Fire, of course, the acid lake and go to the top for sunrise. Being 100’s to take pictures of them working and keep them from working … This is another story. 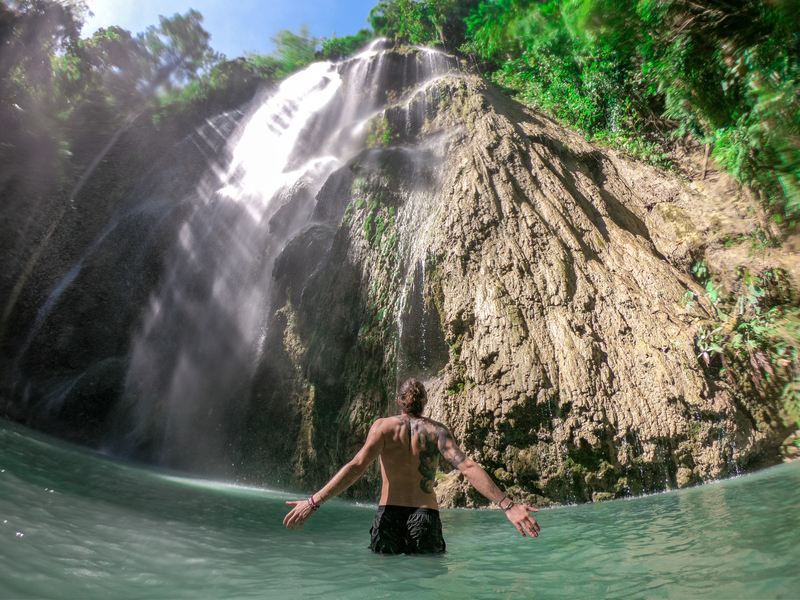 Have you ever seen a documentary about this incredible place or been there long before it got crowded? Did you encounter any problem? What is your Thought in that fantastic place? Did you have to pay the “insurance” ? 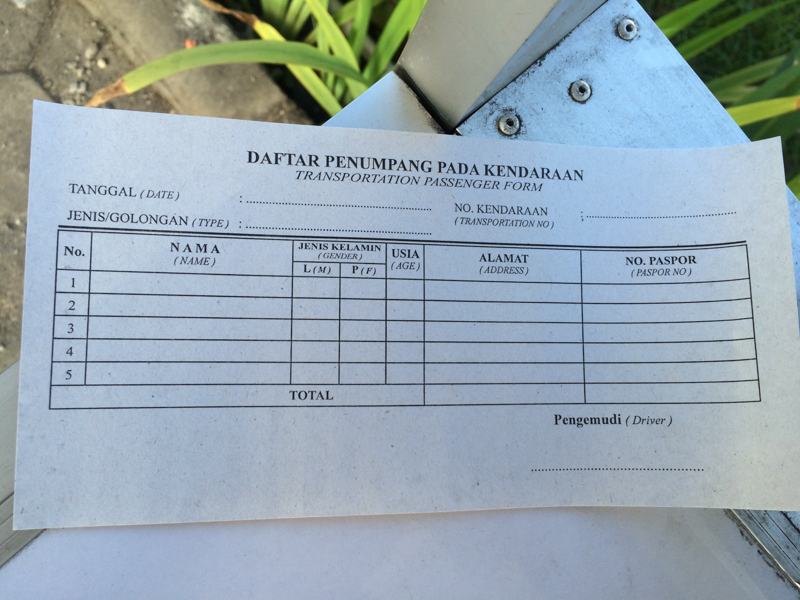 Ferry : The ticket cost 22 000 IDR (1.63 $) for a scooter, you won’t have to pay for a person if you pay a motorcycle (2 people include). 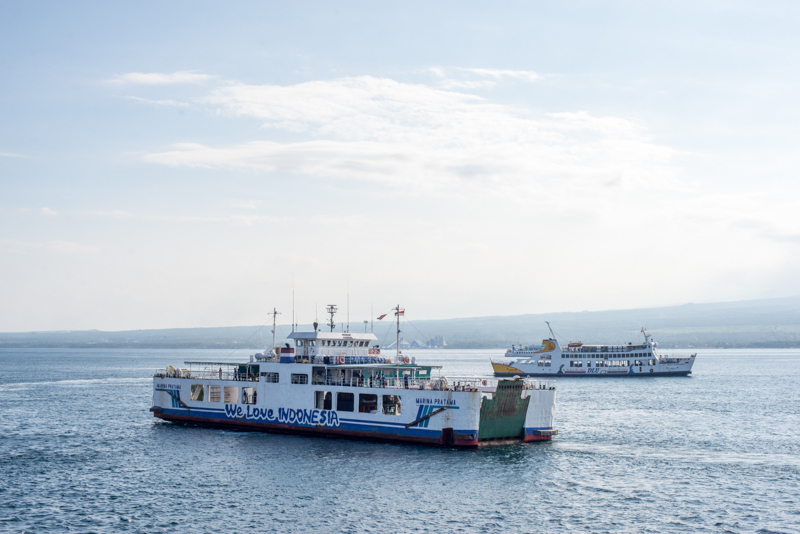 Ferries run every 20 minutes, 24 hours a day and take about half an hour to make the crossing, although loading and unloading can take much longer. In fact, not much. The trek is not insurmountable. 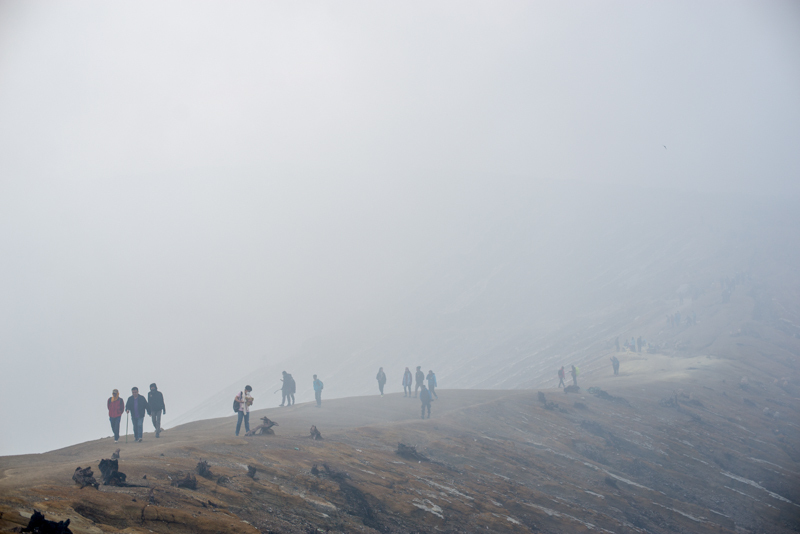 Your walking time will depend on your physical condition, we have taken less than an hour to reach the top of the crater. The trail is very well defined. A pair of adapted shoes, we saw several people with small sneakers, sandals, or flip-flops. It would be a shame to twist an ankle before even seeing the Blue Fire, besides, the location clearly complicates the rescuers arrival. We had 2 liters of water per person. It is important to have enough and have room to carry these liters. But we went back to the parking lot with a full bottle each. Leaving the hotel at 00h15. Arrived at the parking lot at 01h30. Payed 100k IDR / person and start the ascent at 01h40. Arrived on top of the crater at 02h30. 40 minutes to reach the Blue Fire all the way down. 20 minutes to go back up for sunrise. When we got back to the Parking lot, it was 07h30, we drove back to the hotel and arrived at 08h30. We slept until 11h30 and then had to drive all the way back to Kuta for a meeting the same day. 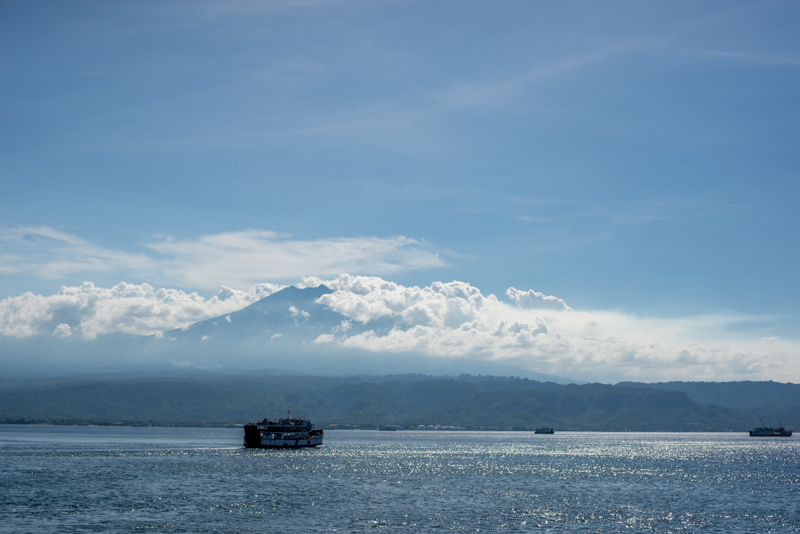 In 15 minutes we reached the port from Banyuwangi and disembarked in Bali at 15h. With a few stops (probably 30 minutes) we arrived at 19h in Kuta. We had no choice this time, but will gladly return and add one day to this trip. But this shows you that it is easily doable in 3 days for people who don’t want to miss it but might be in a rush. And all this for under 100 € for two ! Énorme, paysage magnifique , les émanations de souffre sont insupportable, mais cela vaut le coup d’y aller de nuit pour voir les Blue Fire. Thank you, We will be there too, i hope you are gonna love it as much as we did.